Today's letter is another from jovial regimental band member Oscar C. M. Caines, aka "The Judge," and the first from Camp Nevin, where the regiment would spend a little over a month. One theme that we can draw out when we get past Caines' playful banter (e.g., "our first soprano, Daniel Clemens") is the extension of Lancaster's institutions to the regiment's camp in Kentucky. The reference to the "corner" is I believe a reference to Lancaster City's Centre Square (now Penn Square) and a group of men who regularly interacted there before the war, perhaps due to their business interests. With more certainty, I can say "big 'U'" refers to Lancaster's Union Fire Company, a fire company over 100 years old and a who's who organization of prominent Lancasterians. From a history of the Union No. 1 at the Lancaster County Historical Society, "the response board of Lancaster County Emergency Communications maintains an active tap-out signal for Union Fire Company No. 1, even though the organization has no equipment and the fire house is the Willson Memorial Building of the Lancaster County Historical Society." Besides Caines, I wouldn't expect too many other Union Fire Company members in the 79th Pennsylvania, as they were well-represented in Company B, 1st Pennsylvania Reserves, aptly named the "Union Guards." Camp Nevin, Ky., Oct. 27th, 1861. Friend Wylie: Our Regiment left Pittsburg, on Friday evening, Oct. 18th at 4 o'clock being delayed by the accident, to our boat, read, in your Pittsburg exchange papers. - There was only three seriously injured, C. R. Frailey Adjutant, a private named Landis, and our first soprano, Daniel Clemens, the two former receiving severe contusions of the brain and the latter, having the small bone of his left arm broken, near the wrist. I am happy to inform you that they are all recovering rapidly, Clemens took his place in the Band last Monday, the same day we received by Telegram, the news, that Frailey and Landis would join us in a week. You cannot imagine the feelings of the men on the boat, when the dispatch was read, three cheers and a Bengal Tiger, were given with a will and a roar, that made the broken part of the old boat groan anew. We are all looking for their arrival daily, and when the Adjutant arrives the "Corner" will be all right again. Our fleet of six steamers, arrived at the city of Louisville, on Monday the 21st, at 6 o'clock P. M. The men remained on board the boats, until Tuesday morning; at 10 A. M., marched out to Oakland, a distance of 3 miles, pitched tents, and formed Camp Lyons, no straw with a cold rainy night. Struck tents at 6 A. M. on Wednesday, and marched to the Memphis Depot, where by the liberality of the citizens, we ate a hearty breakfast of bread, cold ham, and hot coffee. Marched out to the commons for Regimental drill, (there not being cars enough to convey the whole brigade.) Returned to Depot at 5 P. M., ate our supper of coffee, ham and bread. Our Colonel, not wishing to quarter his men in the depot, marched us to Boone's Tobacco warehouse, on Main street, between 9th & 10th, occupied by Wm. E. Glover & Co., it was dark when we arrived, and the warehouse closed, the watchman declined admitting us, as they had on that day, stored 1200 hogsheads of tobacco. Word was sent to Mr. Glover, a whole sould Union man, who sent word back to break open the doors, and roll the tobacco on the street if necessary, to make room; but it was found that there was room enough and some to spare. I propose Wm. E. Glover of Louisville, Kentucky, as an honorary member of the "big U," and if elected, that the Secretary be directed to notify him of the same. 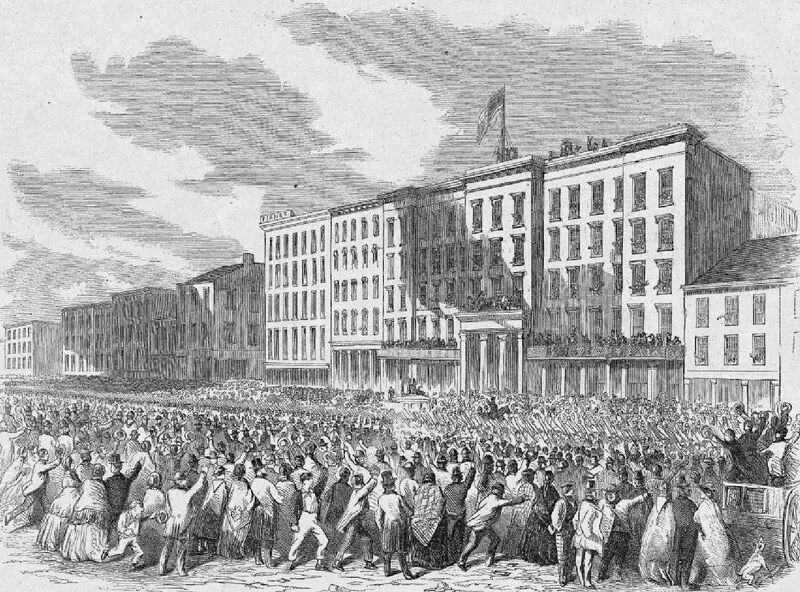 For the second time since leaving home, the Band left the quarters, to serenade some staunch Union men, the first one was Captain Shelby, who entertained the band bountifully; the next was Marshall Halbert Esq., on Broadway, whose house, on the morning of our arrival, was literally covered with banners of the right stripe; and the yard in front of the house was crowded with the youth and beauty of Louisville, each lady with a banner in hand, waving a welcome to the Pennsylvanians. Mr. Halbert followed Capt. Shelby's example. - Next was to Mrs. Henry, the chief of the Patariotic Daughters, (bless that name, it sounds of home,) and the last was given to Capt. Gilbert, who was wounded at Bull's Run. On our return to quarters, Capt. Barker of Gen. Neagly's staff invited the band to Walkers Restaurant, and then, and there, in violation of the army regulations, fed us on Prairie chickens, beefsteaks, ham and eggs, &c. &c., an Oasis in Desert, (of our stomach,) arrived at the Louisville Hotel, where by the kindness of General Neagly, we were provided with lodgings and an early breakfast, arrived at quarters by sunrise, in time to escape, what would have been an unpleasant finale to our previous nights pleasures. Our present location is about fifty miles South by West from Louisville, and one mile from the railroad. The camp is situated on rising ground, dry, and of course healthy. Our Brigade is annexed to General McCook's Division, and it is said by those competent to know, that he has now from 25 to 30,000 men, within a circuit of five or six miles. The main body of the rebels under General Buckner, are within 20 miles of us; the picket guard are on the move day and night, from three to five miles beyond the camp guards. The health of the men in the 77th (our) Regiment is A No. 1, which I attribute in a great measure, to the skill and attention of Dr. Albright, aided by good and subtantial food, and the temperate habits of the men. Whiskey is as scarce in our camp as money, and you might shake every man and not disturb the repose of a single dime. I have a three cent coin in my pocket, the balance on hand when we left Camp Wilkins. I intend to keep it until my return to Lancaster, when I will ask my old friend Harry Zahm to fix a ring to suspend it with, as a memento of the times when I had neither money nor the need of any. Our rations are composed of fresh beef or smoked ham, shoulders or side pieces, coffee or black tea, beans or rice, molasses, biscut, (bread for those that can bake it, for we have plenty of excellent flour,) soap and candles daily. Those who have money to purchase, or any overplus of provisions to barter, can obtain eggs, milk, butter, potatoes, cabbage, &c.
The prices charged are somewhat singular in their average. For instance they charge ten cents a quart for milk, and only fifteen cents per pound for excellent butter, ordinary heads of cabbage, five cents each, and sweet potatoes forty cents a bushel. Our musical mess have this moment returned from a trading expedition, they have three pounds of butter, two dozen of eggs, and two quarts of milk. Fritters for supper, good; I can enjoy, and do, most heartily all the food, except the biscuts; they are a persimmon above my huckleberry, (teeth.) Unfortunately for me, I must have stood on the extreme left of the rear, when the molars were distributed, as I received a poor sett. I have only two left, that can make any impression on what our boys call the Jersey pies, but I thank Nature for those two, being opposite. To see me eating one, would remind you of a grey squirrel, nibbling at a hard shellbark, turning it about to hunt a soft spot to begin on, but when we soak them over night, and fry them in ham fat for breakfast, coated with molasses, they disappear like buckwheat cakes on a frosty morning. Go awry little boy you - daddy's sick, none left for you. We, that is, the regimental quarter-master and the Adjutant (when he returns), and myself, are quartered on the North West corner of the camp; would be "the corner," you see, but with this difference, we have none of the "nutritious element" here, and I am free to say that we all (or both rather,) acknowledge the corn, that it is no loss, but an advantage to us. Do not think I write thus, on the fox and grape idea, or like Jack who would not eat his supper, for it is a truth, and if you doubt it, why try it on for a month or so, and report progress. There is a rumor in our camp, that Gen. Rosseau of the Kentucky Brigade, McCook's division, has orders to strike tents, and advance ten miles forward, towards Bowling Green, if so we will no doubt follow in a day or two.